Is this what we mean when we say "root vegetables"? It's root-tastic. 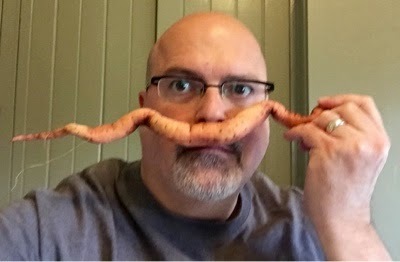 I'd planted some sweet potatoes a while back and the mustache above was typical of the results. 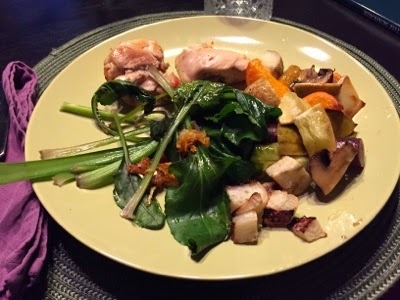 While the extra-tube-y tuber might not look like what we're used to seeing it was still delicious. In the pic below one was sautéed in olive oil along with some beet greens. The beets were also from the garden. The beets, by the way, came out looking, and tasting, like beets. Huzzah! Speaking of gardens, I was thinking the other day (while dealing with both an aphid infestation and a caterpillar invasion) about how growing our own food has increased my family's understanding and appreciation of the challenges and rewards of farming. If you have the space I recommend trying it yourself.